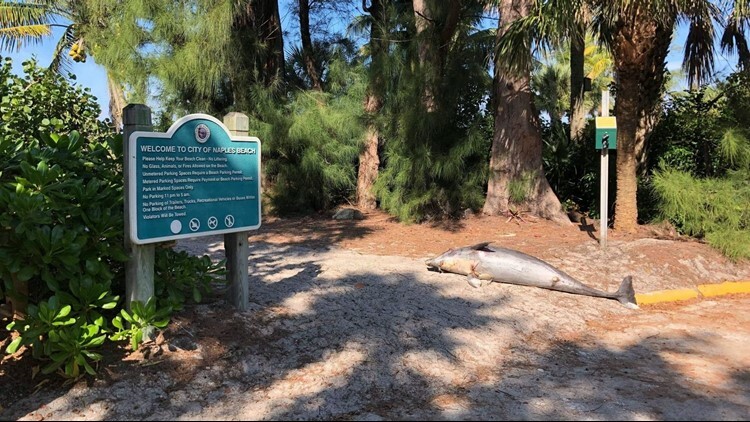 A dead dolphin lies near the entrance of the City of Naples Beach on 1st Avenue North as it waits to be picked up by officials on the morning of Nov. 26, 2018. Researchers are concerned of the potential link as human health could be affected, too. “Not to be too political, but it goes to show the health of marine animals and water quality,” said David Davis, lead author and a University of Miami Miller School of Medicine neuropathologist, to the Miami Herald. Seven of the 14 dolphins were Florida bottlenose, and all had three times the amount of toxins than the remaining seven found dead off Massachusetts. The Herald reports researchers believe it's because they are more likely to swim closer to shore where the blooms occur and eat smaller marine life that consumer the algae. Researchers cannot yet say there is a direct link between the BMAA toxin and brain disease as the study involved so few dolphins. However, they reportedly have begun a second study using some of the nearly 150 dolphins found dead during last year's algae blooms.